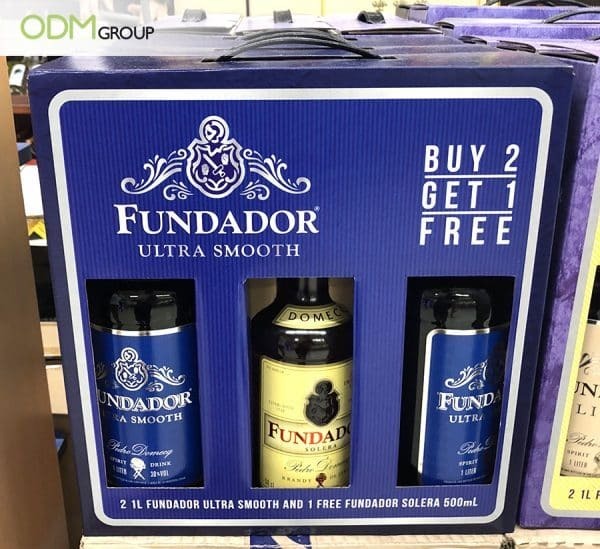 Fundador liquor is offering a buy-two-get-one-free promotion where customers will get a free 500 mL Fundador Solera with when they buy two 1 L Fundador Ultra Smooth’s. The royal blue custom cardboard packaging is just perfect and goes well with the design of their newest line of products. Several years ago, fewer companies pay attention on the environmental aspect of doing business. If there were a few rules or laws surrounding the idea, most of them were not strictly implemented. But now, green marketing and sustainability are a trending concept. Back in the day, plastic was the number one choice for packaging. It is cheap, lightweight, easy to source. Unfortunately plastic is not biodegradable and caused major solid waste pollution problems. As such, Fundador’s choice of using cardboard over plastic is well-thought and applaudable. 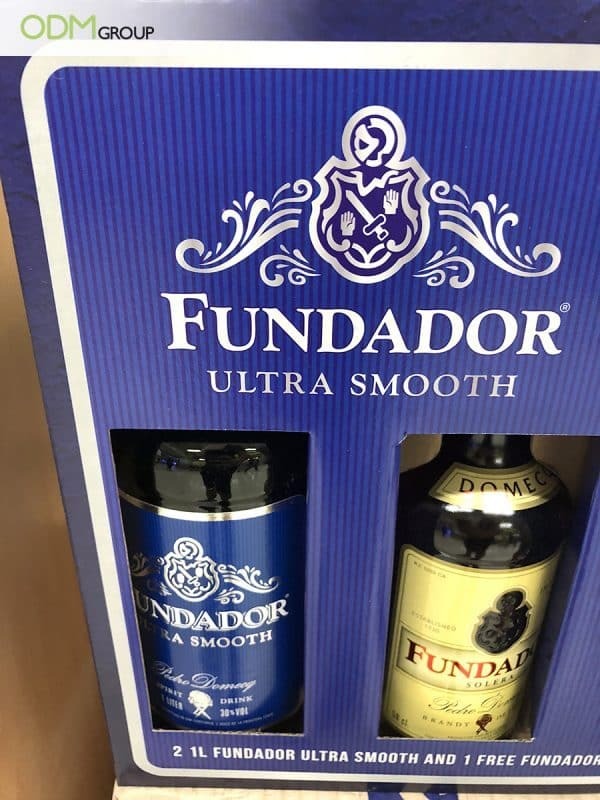 Fundador’s custom retail packaging is a full print pack that promotes their ongoing promotion. It is really effective since shoppers see the promotion immediately. Anyone can easily spot the buy 2 get 1 offer; free Fundador Solera 500 ml bottle for every purchase of 2 bottles of Fundador Ultra Smooth 1L. For cardboard packaging design ideas, check out this cardboard packaging with full printing from Oreo. Why do we like Fundador’s Custom Cardboard Packaging? Brand Promotion – Offering customers something complimentary enhances customer experience and loyalty. But it’s also important that your offer can be easily spotted by shoppers. And Fundador’s cardboard packaging did just that! Design Appeal – This cardboard design perfectly compliments the products. Unlike closed packaging wherein customers guess what’s inside, the cut exposes what’s really inside the promotional pack. Overall, This helps consumers decide whether they should make the purchase. The design has practical and visual appeal that other brands lack. Sustainability – More and more companies are turning to sustainable food packaging solutions such as these cardboard boxes. There is no decline of brand awareness. The production costs are not over the roof. Consequently, it attracts new customers. Furthermore, it’s easy to print designs on cardboard boxes which makes them a very good packaging choice. 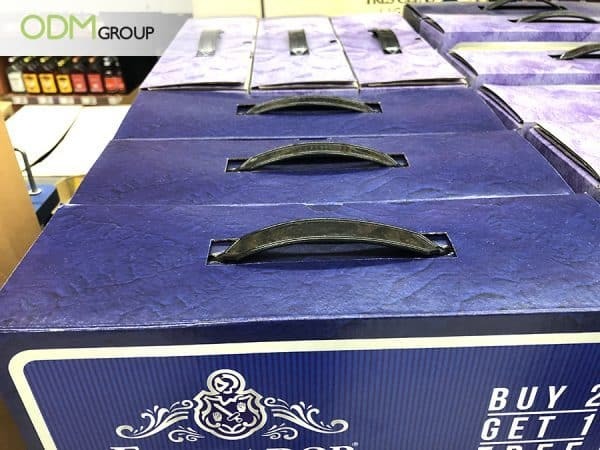 Overall, this custom cardboard packaging from Fundador leaves a bold impression on customers and competitors. It conveys that the brand put strong emphasis on sustainability and the use of eco-friendly packaging materials. A great way to improve brand image whilst protecting the environment. If this wine packaging and promotional merchandising interests you, feel free to touch base with any of the ODM staff. We are professionals in design and manufacturing and are always ready to answer any of your queries about your promotional ideas. This gin brand shows us how great packaging should be done. How to make Customized Gin Packaging – Hendricks Shows Us! This elegant packaging from Talisker Sky makes everyone crave for some good whiskey. The design perfectly embodies the brand’s vision. Moët & Chandon promoteds its ice imperial with custom packaging in various asian stores. This move from the brand projects its own product identity and increases awareness.